Holly Otten’s life clearly reveals the glory of God! She sought a savior—to be saved from the mire that she was born into. She found her savior, and His name is Jesus Christ. Otten has walked “hand in Hand” with God ever since; twenty-two years now. Jesus Christ took the shattered pieces of her life and brought her freedom and wholeness. With the help of her Savior, she has overcome the damaging affects of sexual abuse and neglect, a nervous breakdown, four miscarriages, and divorce. 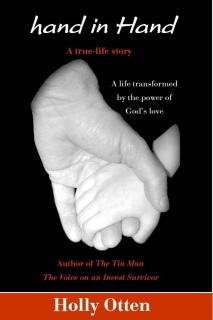 Holly Otten’s life is a testimony of the healing and transforming power of the living Christ! By surrendering every obstacle of her life to Christ and by claiming the promises found in God’s Word, she has received healing of twenty years’ clinical depression, hypoglycemia, asthma, fibromyalgia and chronic fatigue, as well as the healing of her son’s mental illness.